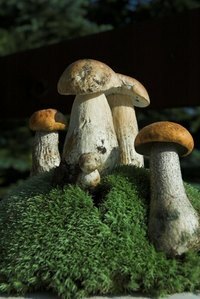 Growing mushrooms can be a fun and interesting experience. Mushrooms differ from plants in that they grow from cultures rather than seeds. A culture sprouts many mushrooms, but only if it's properly cared for. As a fungus, mushrooms require warmth and moisture for growth, so they are commonly grown in incubators. Instead of buying an expensive incubator, duplicate the incubation process on your own, using glass jars and a pressure cooker. Wash birdseed beforehand, to provide a clean substrate for mushrooms. Put it in a bucket and rinse it with water, then remove any husks or seeds that float to the top. Pour off the water. Pour birdseed into your jars until they're 3/4 full. Pack polyester fiber stuffing into the remaining space. Drill holes in the lids to allow for air circulation, and screw the lids onto the jars. Tighten the lids all the way, then turn them back a quarter turn for additional air flow. Put coffee filters over the lids and secure them with rubber bands. The jars and coffee filters become mini incubators in the growing process. Put the jars into the pressure cooker for an intense incubation period. Heat them at 15 pounds for 60 to 90 minutes, then let the pressure cooker drop back to zero pounds. Carefully remove the jars, tighten the lids, and put them in the oven overnight to continue to incubate the foundation. Inject the mushroom culture into the birdseed per the directions on the packaging. Mushroom cultures are available at home and garden and hydroponics shops. Put the jars in a thick, secure cardboard box for additional incubation. Place the box in a dark closet. Mushroom sprouting depends on what type of mushroom you're growing.